First cut a 6"x 9 1/2" piece of white card stock and fold it in half for the base, cut a 4 5/8" x 5 7/8" piece of yellow for the first layer, a 4 1/2" x 5 3/4" piece of white for the front, a 3 1/2" x 4 3/4" piece of yellow for the embossed background rectangle, a 3 7/8" x 3 7/8" piece of yellow for the square's first layer, a 3 3/4" x 3 3/4" piece of Stampin' Up! Painted Blooms Designer Series Paper for the square front, a 2 7/8" x 3 1/8" piece of yellow for the image background and a 2 3/4" x 3" piece of white for the image. Next emboss the 3 1/2" x 4 3/4" piece of yellow card stock with a Cuttlebug Swiss Dots embossing folder and attach it to the front layer. Then attach the Designer Paper to the 3 7/8" x 3 7/8" piece of yellow card stock then to the front layer over the embossed layer. 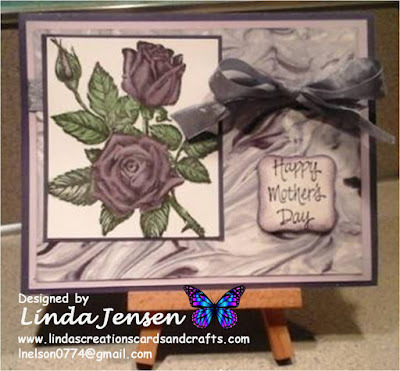 Then using a Stamp a ma jig stamp the lemons on the 2 3/4" x 3" piece of white card stock with Stazon Jet Black ink and color the lemons and leaves with an aqua painter and Stampin' Up! Daffodil Delight and Pear Pizzazz ink pads. Next stamp a lemon on another piece of white card stock and color it the same as the others, cut it out and attach it to the others with a mini pop dot. 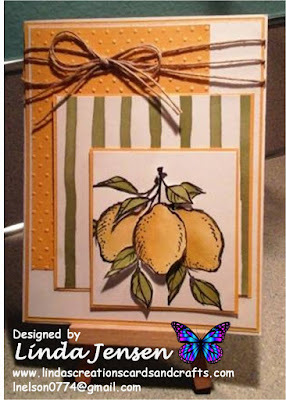 Then attach the lemons to the 2 7/8" x 3 1/8" piece of yellow card stock then attach it to the front over the Designer Paper. Next tie the hemp twine around all layers, attach them to the base and enjoy!